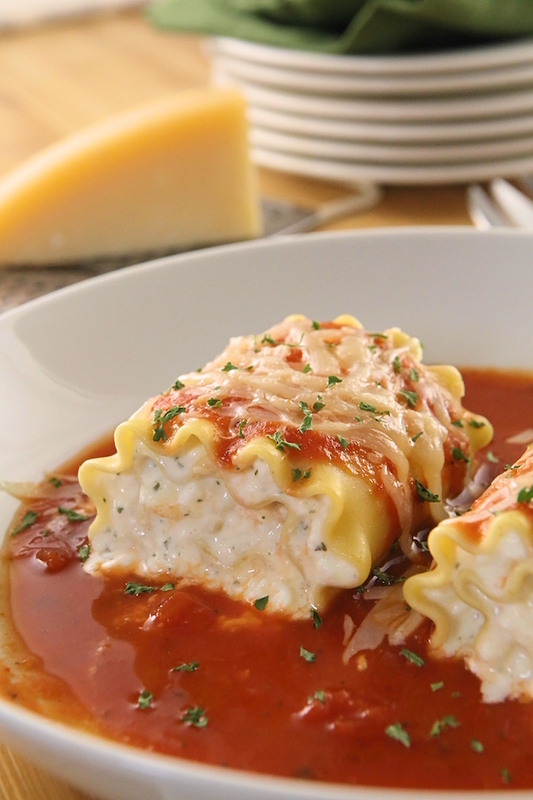 Make a big batch of these easy, cheesy Lasagna Roll Ups, and freeze the other half for a future quick dinner. 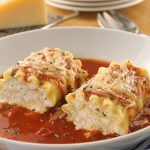 These are like individual lasagnas and just one box of lasagna makes plenty of rolls, which is why it makes a great make-ahead meal. This recipe is very yummy and pretty basic. You can certainly alter the ingredients to what you may have on hand and no cooking is involved during the prepping, which makes this make-ahead meal easy and freezer friendly. 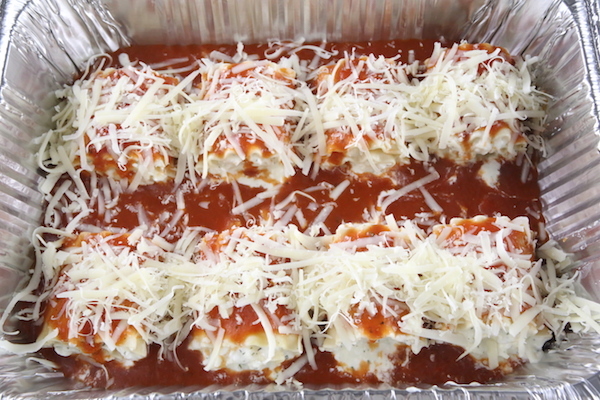 Since a (16oz) box of lasagna makes about 18 rolls, you can bake some right after prepping and freeze the remaining for a quick future dinner or just freeze them all for future meals. Not only does this make two easy and very tasty dinners, but how awesome is it when you can pull out a homemade freezer meal. 1. Place lasagna noodles in very hot water to soften. 2. 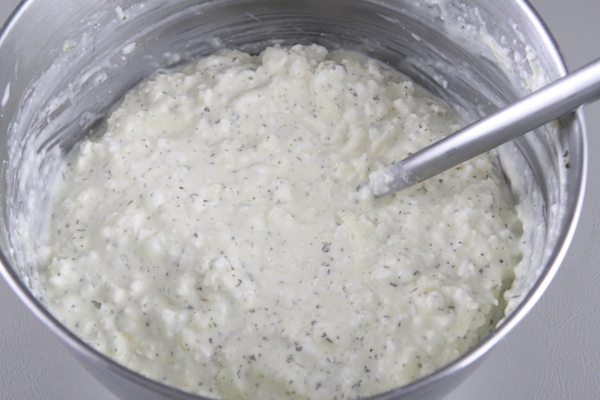 Mix together the cottage cheese, cream cheese, 1 egg, 1/4 cup parmesan cheese, 1 cup of Monterey jack cheese, dried basil and parsley. Set aside. 3. 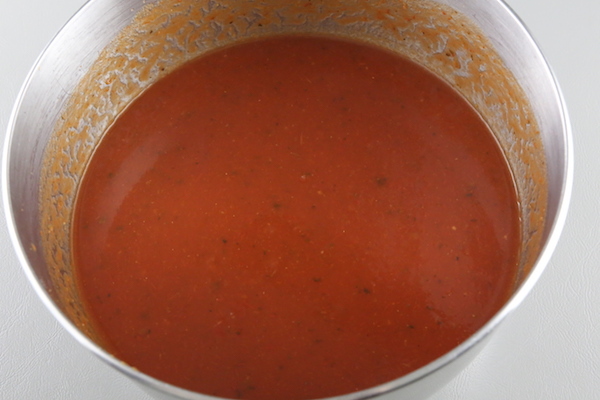 Pour the spaghetti sauce into a bowl and fill the jar up with 1 1/2 cups of water; cover jar with lid and shake up to get all the excess sauce out of the jar. Whisk together water and sauce until smooth. 4. 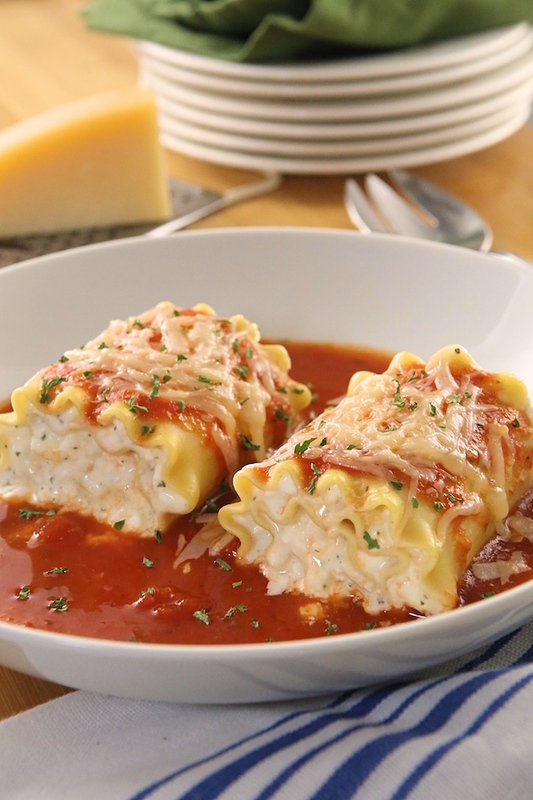 When lasagna is soft enough to handle, spread 2 tbsp of filling over each lasagna noodle and roll up. 5. Arrange 8 rolls into each baking dish (two 10″ by 8-inch disposable foil pans) and evenly divide the sauce among the two pans. Sprinkle remaining parmesan and Monterey jack cheeses onto the tops and secure tightly with aluminum foil for freezing. 6. To prepare right away, bake covered in a 375 degree oven until heated throughly (35 min.) Then remove aluminum foil and lightly broil the top. 7. 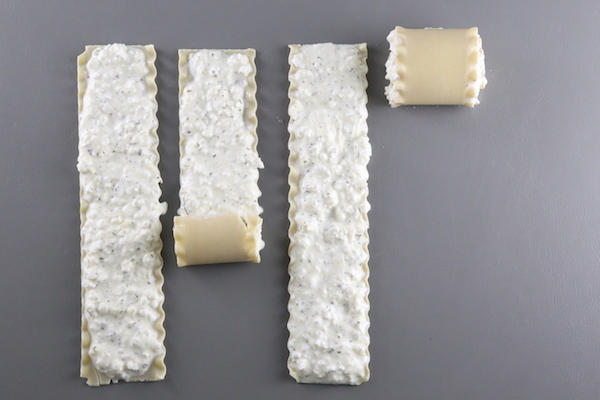 To prepare frozen rolls, thaw throughly and bake 35-45 minutes covered. Then remove aluminum foil and lightly broil the top. 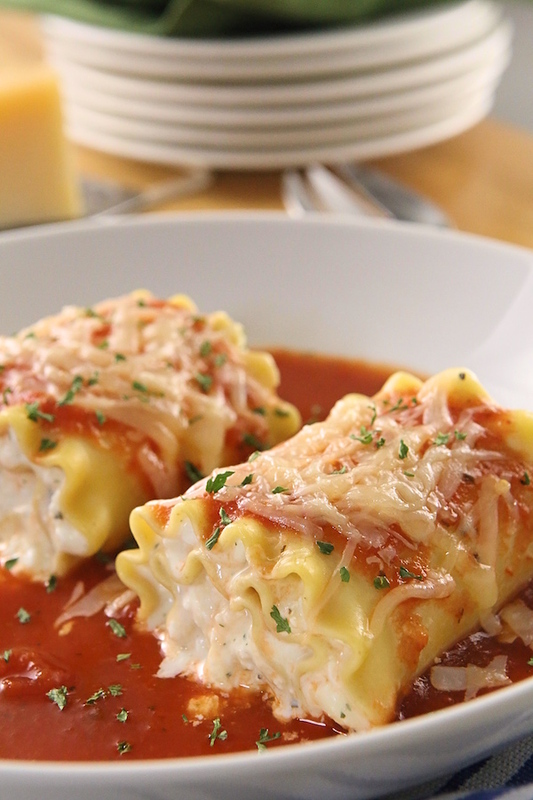 Make a big batch of these easy, cheesy Lasagna Roll Ups, and freeze the other half for a future quick dinner. 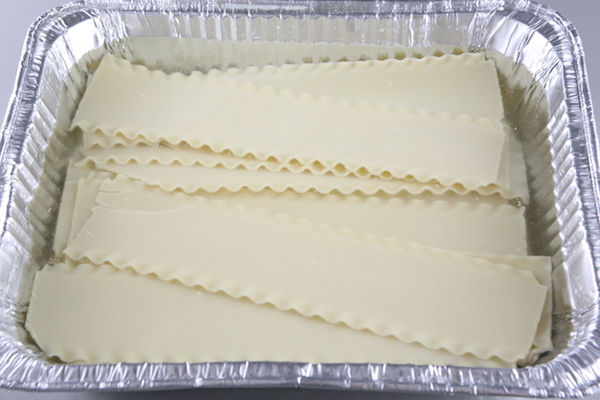 Place lasagna noodles in very hot water to soften. Mix together the cottage cheese, cream cheese, 1 egg, 1/4 cup parmesan cheese, 1 cup of Monterey jack cheese, dried basil and parsley. Set aside. Pour the spaghetti sauce into a bowl and fill the jar up with 1 1/2 cups of water; cover jar with lid and shake up to get all the excess sauce out of the jar. Whisk together water and sauce until smooth. 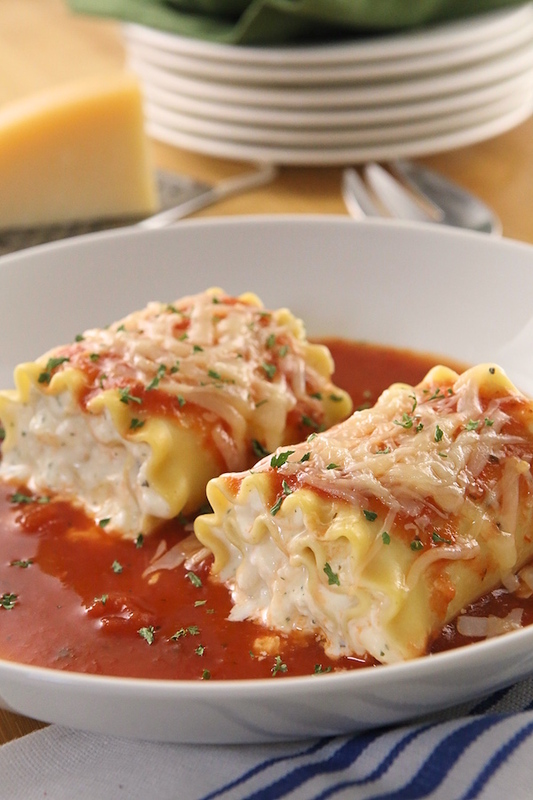 When lasagna is soft enough to handle, spread 2 tbsp of filling over each lasagna noodle and roll up. Arrange 9 rolls into each baking dish (two 10" by 8-inch disposable foil pans) and evenly divide the sauce among the two pans. 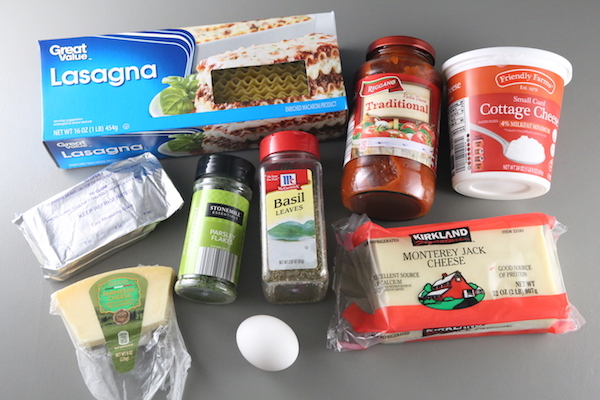 Sprinkle remaining parmesan and Monterey jack cheeses onto the tops and secure tightly with aluminum foil for freezing. To prepare right away, bake covered in a 375 degree oven until heated throughly (35 min.) Then remove aluminum foil and lightly broil the top. To prepare frozen rolls, thaw throughly and bake 35-45 minutes covered. Then remove aluminum foil and lightly broil the top.